HOW DOES THE LINKR PRODUCT MANAGER WORK? Most influencer campaigns involve sending samples to selected influencers. This usually leads to marketers having to mail back and forth with influencers on which products have been selected, which size, color, fabric,... is needed, whether or not that particular selection is still on stock, which address to ship it to, etc. 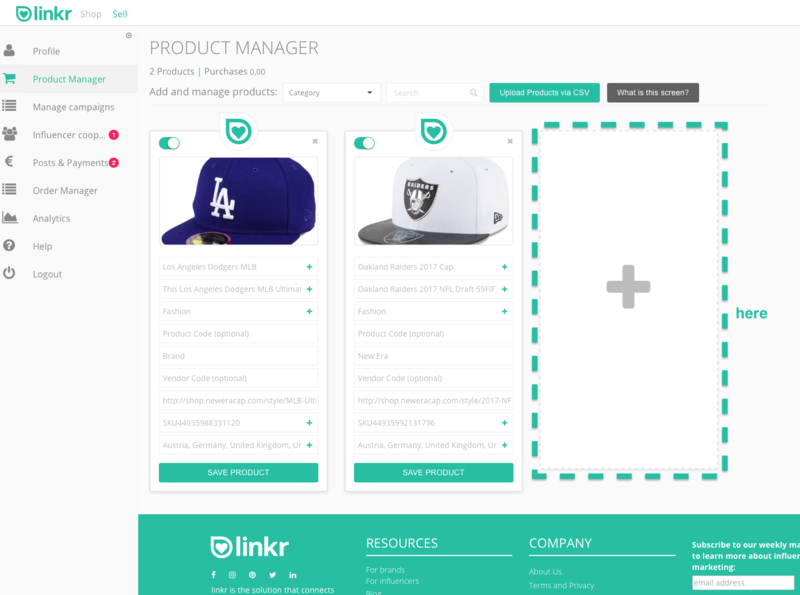 linkr takes a different approach by letting you enter / import product description and availability data on the Product Manager. 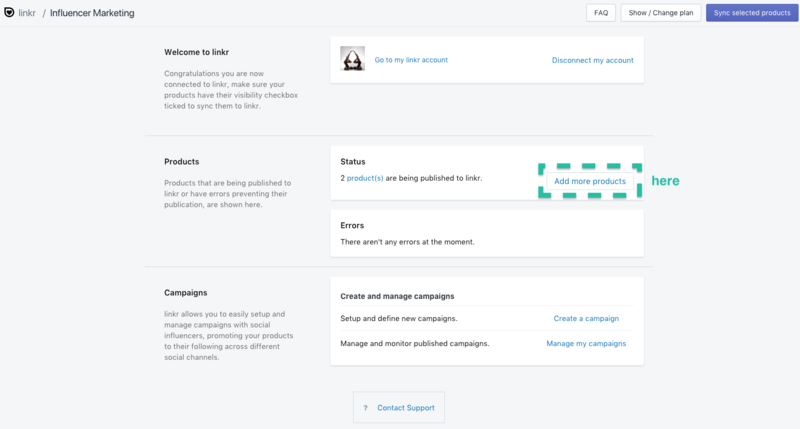 These products can then be added to a campaign during the campaign setup process. When influencers apply to the campaign, selecting samples for them is turned into some sort of a shopping experience. Like an online shop, linkr doesn't let them choose a SKU you no longer have on stock, doesn't let them choose more than the limits you did set,... Also, capturing of the shipping address is part of the influencer application process. If you're a Shopify merchant and have the linkr Sales Channel App installed, you can simply sync-over selected products to linkr. To do so, switch to the linkr Sales Channel App. On there, click add more products. 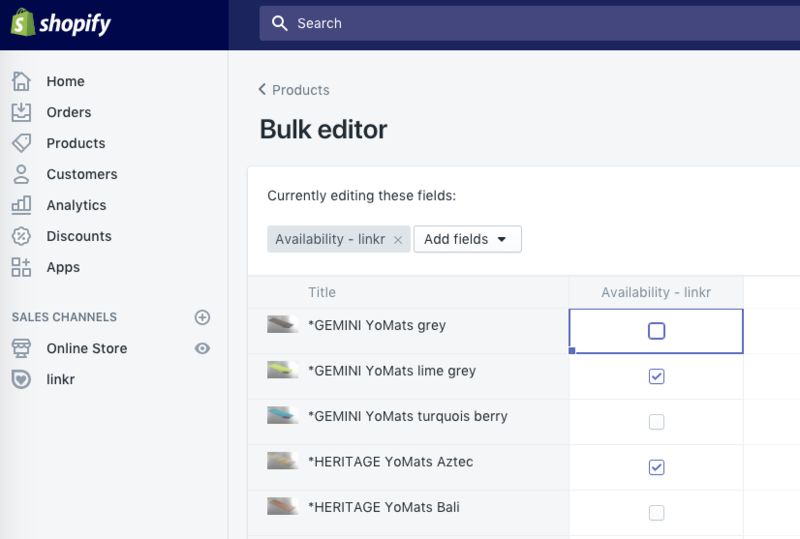 This will open the native product bulk editor on Shopify, on which you can set which products shall be available on linkr by ticking the checkbox next to each product you'd like to sync over. For reasons of performance and better overview, we would recommend to only sync the products you'll need for your campaigns, instead of moving your entire inventory. Product information as well as availabilities will automatically keep in sync between linkr and your Shopify store. If your store doesn't run on Shopify, you can either setup products manually - which takes roughly a minute per products - or upload a CSV file, in case you need to setup a larger amount of products. For uploading CSV files, please check our CSV Import Tutorial. To manually add a product, click on the + symbol on the linkr Product Manager. A new product tile will open. On there, you can set basic product information such as description, images, category but also SKU specific information such as color, size, availability. In addition, you can define which countries you're shipping products to as well as setting a URL back to the product page on your store. Make sure to click "SAVE" before you're moving on to another site. Otherwise all your changes will be lost. Once saved, the little switch in the top left corner of each product allows you to activate / deactivate products. Deactivated products are no longer visible to influencers.